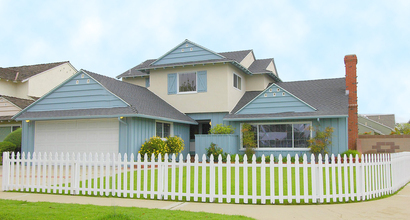 Lot Size: 5800 Square Ft.
Charming Story-Book Home complete with the White Picket Fence! Located on a quiet cul-de-sac street in the community of Torrance, this two-story home is in PRISTINE condition. With a generous floor-plan of approx. 2,048 sq. ft., this property features a spacious Formal Living Room with Fireplace, a spotless Kitchen and Dining Area, 4 bedrooms & 2.5 baths, and a large landscaped backyard with patio and room for RV Parking. New Exterior & Interior Paint, and staged to perfection. Owner may consider carrying a large second trust deed. Terms to be Negotiated.